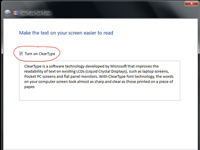 ClearType improves legibility of text on an LCD display. 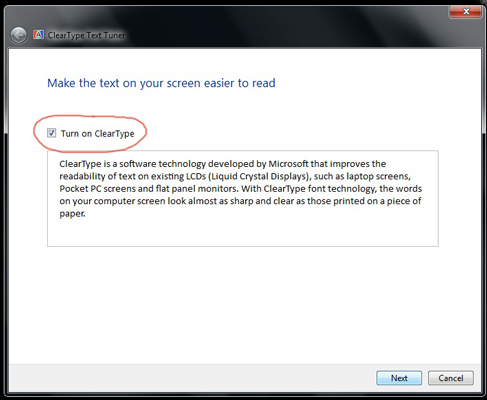 Nearly every monitor made today is improved with the use of ClearType, but you can often make the display even better if you take the time to fine-tune the ClearType text display in Windows 7 to suit your specific monitor, lighting, and even eye sight. 1On the Start menu, type clear and click Adjust ClearType Text. The first screen of the ClearType Text Tuner appears. 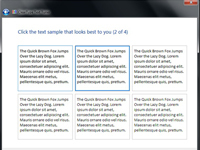 The tuner is a series of dialog boxes that help you fine-tune text sharpness. There’s also a link from the Display window where you adjust screen font size. 2Select the Turn On ClearType check box if it isn’t already selected. Click Next. You may notice an immediate improvement in text legibility in the box. 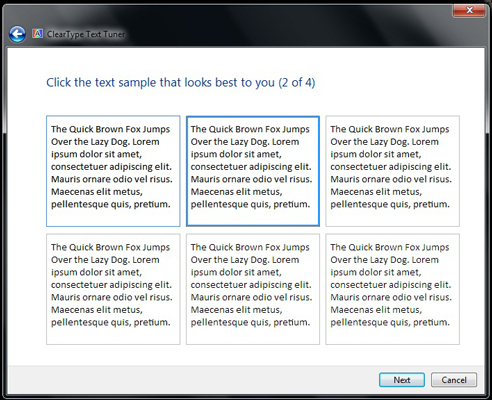 3In each of the next four dialog boxes, click the box containing the sharpest text. This is like a visit to the eye doctor — better or worse? One or two? Don’t fret; there is no right or wrong answer. Just go with what looks sharpest. 4Click Next on each screen. Click Finish at the end. The last screen indicates that you’ve finished tuning the text on your monitor (screen).